As adults with full-time jobs, bills to pay, and other stressors of adulthood, it’s easy to look at preschool-aged children and joke that “the preschool life is hard,” when your child throws themselves into full-fledged meltdown over not getting a sucker in the checkout line or having to eat dinner at the table. While as adults it’s easy to assume a child’s life as stress and worry-free, the truth is children, even preschool children, can struggle with stress and anxiety. So, how do you know if your child is struggling with these emotions and what can you do as a parent to help relieve these symptoms for your child? First, one must be aware of the common sources causing your child to feel stressed and anxious. While preschool children do not have the same stressors as adults, it’s important to recognize that children are still faced with demands that can cause them to feel overwhelmed, stressed, and anxious; causing physical effects, such as a pounding heart, rapid or shallow breathing, increased blood pressure, a sense of doom, and more — just like adults. Here are some common sources of stress and anxiety in children. Preschool education is often the first time children are separated from their parents for more than just a few hours. As a parent who has nurtured your child from the day they were born, your daughter or son looks at you as their source of love and safety. That being said, leaving them for the first time can cause a sense of alarm causing tears and screams. While our passionate and caring staff at Kidstown Learning Center in Lake Worth does everything we can to make your child feel loved and secure, while making preschool education fun and exciting, children are still aware when they don’t have as strong of skills as their peers. This can make your child feel like they can’t do something they should be able to, thus causing stress and anxiety. Social pressure is another aspect of preschool education that can cause emotional distress for your preschooler. No matter how young or old, it’s human nature to want to feel accepted and fit in with one’s peers. If your child is shy, they may have a more difficult time making friends and can feel stressed and anxious over not having anyone to play with. Family is a child’s security system, so when there any big changes, such as the loss of a job, illness or death, divorce, or other complicated factors, it may cause your child to feel stressed and anxious. No matter your age, stress and anxiety can cause headaches and stomach aches. If your child begins complaining of headaches and stomach aches, without a medical reason, this may be a physical indicator that your child is suffering from stress and anxiety. Stress and anxiety can cause intense physical symptoms, such as a pounding heart, shortness of breath, dizziness, and other scary symptoms for your child. If your child begins having panic attacks, your child might be struggling with stress and anxiety. Bed wetting is common in younger children, but becomes a sign your child is struggling with stress and anxiety if your child goes from having regularly dry nights to suddenly wetting the bed again. If you notice a change in your child’s sleeping patterns, for instance they begin having trouble falling asleep, wake up frequently throughout the night, or wake up fatigued your child could be struggling with an underlying stress and anxiety issue. A common stress and anxiety indicator is a change in eating patterns. If you notice a significant change in your child’s eating patterns, such as loss of appetite or excessive eating, this may be a sign your child may be emotionally eating due to stress and anxiety. Stress is linked to causing nightmares. If your child has a stressful day, they are more likely to have a nightmare that night. Therefore, if you notice your child begins having frequent nightmares, this may be a sign your child is overwhelmed with stress and anxiety. School, especially your child’s first year of preschool education, can be a hard transition for children who suffer from separation and social anxiety. If your child refuses to go to school, this may be an indicator that your child has stress and anxiety. Is your child suddenly overreacting to minor problems, becoming angry for no apparent reason, and/or acting extremely sensitive? This may be how your child is handling their emotions of stress and anxiety. If you notice your child isn’t participating in activities at school, doesn’t want to play with other children, and prefers to be alone, this may be a sign that your child is suffering from social anxiety. If you think your toddler is struggling with stress and anxiety, don’t worry. There are many ways you can help! Stress and anxiety are difficult emotions for your toddler to handle. By maintaining a positive attitude around your toddler, you can help your child focus on the positives and change their mental attitude. New changes, such as starting preschool can be extremely challenging for preschool children. Creating and maintaining a daily routine, however, can help your child cope with big changes by helping the know what to expect throughout the day. A bedtime routine is especially important for preschool children who are struggling with stress and anxiety as sleep deprivation can actually make symptoms worse. Help your child understand their feelings and let them know they are not alone by reading books with them that have a storyline relating to stress and anxiety. Children can learn how to cope with stress and anxiety by seeing how one of their favorite characters was able to overcome their fears or handle tough situations. As a toddler, your child may have difficulty expressing how they feel. As a parent, it’s important to ask questions that encourage your child to share more about how they are feeling to help you determine what the underlying cause of their stress and anxiety is. It’s important, however, to avoid asking leading questions. You want your child to express their feelings on their own. While as a parent it is difficult to see your child unhappy, it’s important to realize that you want to help your child manage their anxiety, instead of eliminating it. Removing the stressors from your child’s life may reduce their stress and anxiety short-term, but in the long run it will actually maintain their stress anxiety and make it more difficult to cope with overwhelming situations in the future. Preschool education can be a huge transition and lifelong learning experience for preschool children. Your child’s first year of preschool exposes them to many stressors that can cause your child to feel an increase of stress anxiety. 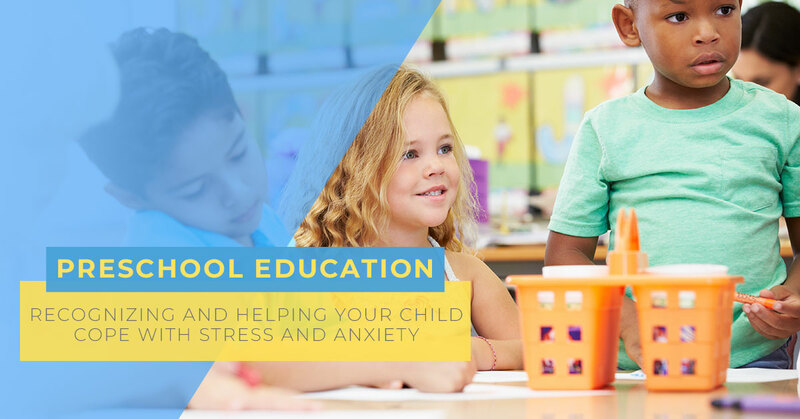 It’s important to be aware of the common sources, signs and symptoms of toddler stress and anxiety, as well as the different ways you can help your preschooler cope with these new, overwhelming feelings to help set them up for a positive preschool experience and healthy life. At Kidstown Learning Center in Fort Worth, our mission is to provide children with a foundation for learning in a fun, loving and safe environment. Learn more about our child care services and preschool education today.